The once voted top fifth public intellectual figure in 2005, both by Prospect Magazine (British) and Foreign Policy (American), Christopher Hitchens died yesterday, having struggled with esophageal cancer, at 62 years old. The prolific author and journalist wrote for publications such as Vanity Fair, The Atlantic, The Nation, Slate, among others. But Hitchens was also well known for advocating New Atheism: a 21st century movement, which believes that religion should not simply be accepted; rather, New Atheism stands for creating counter-arguments against religion by applying a consistent critical eye and employing rational arguments whenever applicable. 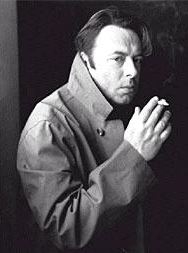 One of Hitchen's most popular books is God Is Not Great, (2007): a manifesto on atheism, which reached the No.1 on the New York Times Top Seller List, for three weeks in a row. In the book, the polemicist, infamously argues that the concept of God is totalitarian, in which religion disfigures free-will, individualism, and scientific discovery—claiming that science should supersede religion as the ultimate guide to continue to develop human civilization. Have a watch at Hitchens answer to being asked and interviewed by Salmon Rushdie on making a, "compelling argument on the existence of God," (featured above), as well as Rushdie and Hitchens play a literary game (featured at right via ForaTV).